PHOTO BELOW: Brian with other firemen and friends from the transport group – Tommy Verdon and Peter Knight. 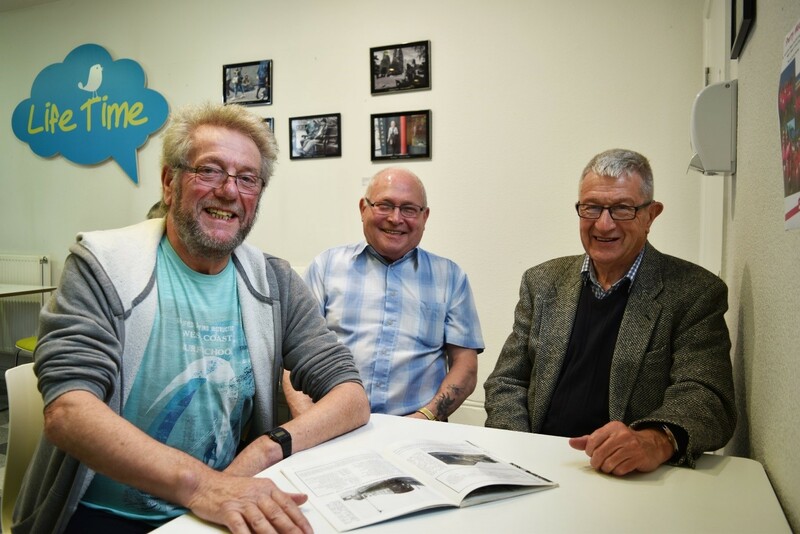 Brian and his former workmates were reunited after a chance meeting at the LifeTime Centre – and went on to set up the Transport Group together. Now they can be seen most days at the centre – enjoying their friendships again and swapping stories of their times on the railways. Here 72-year-old Brian tells us about being a fireman and shares his passion for the railways. He said: “I worked seven years on steam engines and six on the diesels. My job was to keep the train in steam and I worked alongside the driver to make sure the engines ran well. “The freight trains did long trips to London and Carlisle but also local routes to places like Liverpool, Chester and Llandudno. “We worked in eight-hour shifts, sometimes longer and sometimes on short shifts. It was really important to have a good relationship with the driver that you were working with – as you spent a lot of time together in a small space – you had to trust each other to do a good job. Some drivers were more difficult than others to work with. “A fireman had the longest apprenticeship in the country at the time, I started in December, 1961 and became a passed cleaner in May, 1962. I became a fireman in 1965, I then took my redundancy in June 1973. “My favourite trips to work on were either the express passenger or freight train. I also really enjoyed excursion work to places like Blackpool – as we used to get six hours off before the return journey and you could have a really good time in Blackpool in six hours! “The hardest point of working on the steam engines was when you were going uphill – but it was also an adrenaline rush – making sure your engine was running well. You needed a good steamer that produced a grey colour – not too dark and had to get up to 200/250F. “It could also be difficult coming into a ‘dead end’. You had to make sure you ran the fire down. “I am passionate about steam engines, it was a great time, we all had a laugh together – in fact, one of my fondest memories was when I pulled the water column down – the driver got in trouble – but it was a talking point at the time and we have all laughed about it since!